To meet dress code requirements, the students must present themselves in the approved regulation uniform coordinate or their exact equivalents. All uniforms must be worn in the manner displays by the manufacturer. No mutilation of any kind including tearing, ripping, or cutting of the cuffs, sleeves, or body of any of the coordinates. The uniform must be correct in size to avoid any sagging or sloppy appearance. NO CARGO PANTS. No visible manufacturer’s logos of any kind will be allowed on any uniform item including belts and socks. Ex. Nike sign, Polo, Champs. Tennis/athletic shoes are the only exception. shoulders. In warm weather, the administration may require all outwear to be placed in the locker after arrival at school. Any deviation from this may require a physician’s note. Plaid Items # 57 may be purchased at either Dollar Mania, Sports World or Shreveport Gymnastics. Our plaid is plaid #57. All other items are carried at Sports World, Shreveport Gymnastics, Burlington, J. C. Penney's, Sears, Wal-Mart and K-Mart and Jmart as well as Pierre Bossier Mall Uniform Store. Pants, shorts, capris, and skorts for boys and girls should be "UNIFORM STYLE" only. 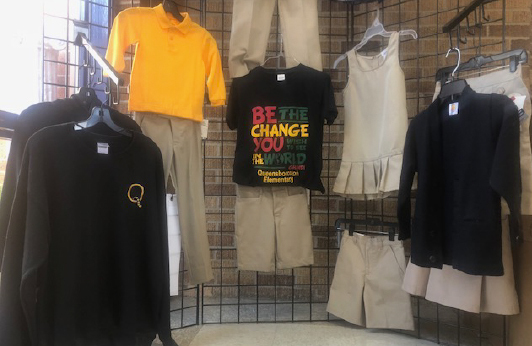 These "UNIFORM" pieces can be purchased in the "UNIFORM" section of the above mentioned stores. Cargo, carpenter, beige denim, low riders, hip hugger, bermuda and all other store brand/designer name brand shorts, skorts, and pants not part of our uniform. Knit Polo style shirts need to be "UNIFORM" type shirts, free of eyelet, laces, ruffles, etc. Spirit Day: Students can only wear their Queensborough Embroidered Sweatshirts or Hoodies and School T-shirt. Brown or Black belts must be worn with all shorts or pants with belt loops. Please note - Blue and White polo style shirts or the Blue Jumpers are not part of our uniform. 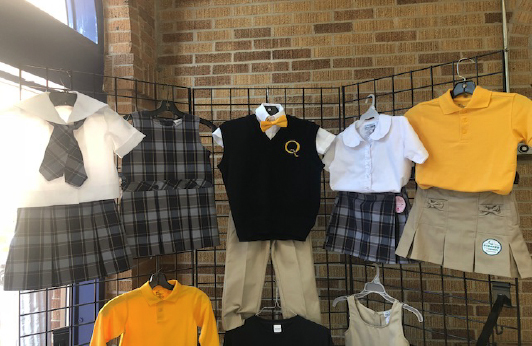 IT’S HIGHLY RECOMMENDED THAT EVERY STUDENT HAS A QUEENSBOROUGH SWEATER VEST AND WHITE BUTTON DRESS SHIRT THIS SCHOOL YEAR. Brown or Black belts must be work with all shorts or pants with belt loops.